Bollywood superstars Shah Rukh Khan and Salman Khan, who share a bittersweet bond, are contending for hosting Grammy Award winning Canadian singer Justin Bieber in Mumbai. According to sources, leading industrialist Mukesh Ambani is also in the list of possible hosts to the 23-year-old singer, who will perform on May 10. The pop star will arrive in Mumbai on May 8 for his Jio Justin Bieber Purpose World Tour, organised by White Fox India. 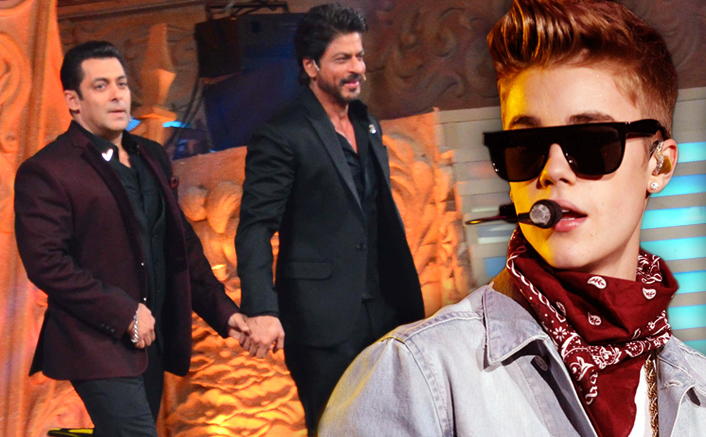 The final host will be decided when Bieber lands in India. The battle doesn’t end with hosts. Sources state that there is a tie for the opening act of the concert between the teams of upcoming films Half Girlfriend and Meri Pyaari Bindu. The makers of both the films want to promote their film at the concert before Bieber takes to the stage but both the production houses want to be the exclusive film promotion partner. Interestingly, the films have actresses who have showcased their singing talent in the past. While actress Parineeti Chopra stars in “Meri Pyaari Bindu”, Shraddha Kapoor plays the lead role in “Half Girlfriend”. Despite their singing skills, sources say that the clause of no live act is posing a problem in the decision making process. While that is yet to be decided, the organisers have confirmed that actress Jacqueline Fernandez will be hosting the Ultra Lounge for her celebrity friends at the concert. Her guest list includes the likes of Abhishek Bachchan, Aishwarya Rai Bachchan, Deepika Padukone, Ranveer Singh, Karan Johar, Gauri Khan, Manish Malhotra and Kangana Ranaut. And meanwhile, as many as 100 underprivileged children will get to attend the concert for free. A special lounge will be created to host children, who don’t have the resources to purchase a ticket. The lounge will accommodate close to 100 children who will be given complimentary food and beverage apart from the best viewing to the May 10 show. The most expensive ticket – worth Rs 75,000 — has also been gifted to an autorickshaw driver’s teenage son who is an avid fan of Bieber. Bieber has helped patients suffering from Leukemia, Meningitis and Down Syndrome apart from building schools.